I am a huge fan of Rainbow Rowell and her books. Especially Eleanor and Park. There is a lot of hype around this one and I am afraid that going in to it with very high expectations will be my downfall. I loooooved Fangirl, mainly because I related to Cath maybe a tiny bit too much... I agree about the fanfiction thing, though. When I wrote my review, people were like 'FANFICTION IS A LEGITIMATE FORM OF EXPRESSION AND IT'S NOT PLAGIARISM.' and I'm like, both of those things are true (well, I think so) but it's still not appropriate as an assignment for a college course! How could it be?! Madness. Also, for the record, I like Attachments better than Eleanor and Park! But I feel like Fangirl might actually be my favourite... I don't know, I just love them allllllll! 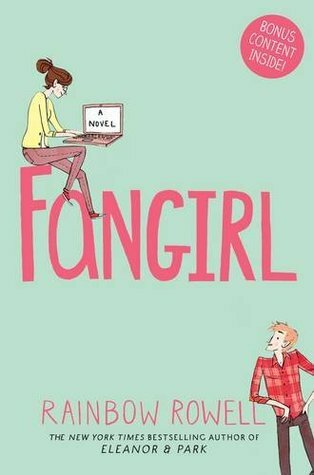 I still haven't read Fangirl, Ellie :))) but I'll be curious to see if I feel different about it. I haven't read this one yet, but have heard nothing but good things about it. It's kind of nice to hear a not-so-good review about it, although I still look forward to reading it. E&P is something I have my eyes on next though! Hi Jillian, I hope you have fun with the readathon! Rainbow would be a great readathon choice, easy to just sit down and get absorbed into her worlds. Rowell writes such believable characters. Attachments is actually my favorite so far, but I enjoyed Fangirl too (I haven't read Eleanor & Park). I am not a fan fiction reader or writer, but I am interested it from a legal perspective (which was the focus of my comments in my review of Fangirl last September).